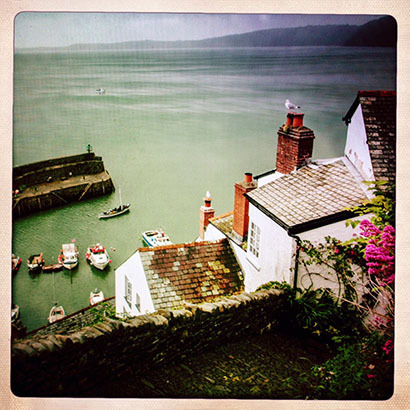 Tucked into the north Devon coast, overlooking the Bristol Channel is the small village of Clovelly. Though no longer supported by the fishing upon which it became established, Clovelly is a magnet for tourists, drawn by the steep cobbled streets and chocolate box cottages. Clovelly is privately owned, and the houses, many of them wattle and daub and almost all Listed properties, are positioned either side of a rocky cleft. The main ‘street’ is on too sharp an incline for most vehicles and sledges have to be used to move goods up and down. The scatter of small fishing boats in the harbour do not reflect Clovelly’s glorious past, when more than a hundred vessels would plunder the massive herring shoals that worked their way inshore. Just two herring fishermen work out of Clovelly today, though the village celebrates its history on the third Sunday of November when thousands of people converge for the Annual Herring Festival. Here, there is music, food, local produce (with a strong herring influence) and a jolly good knees-up in recognition of Clovelly’s heritage.